Justice for Trayvon Protest Rallies Across U.S. Wearing a hoodie, Rev. Dr. Norwood Thompson, chapter president of the Southern Christian Leadership Conference, speaks to the crowd at a rally held in reaction to the recent George Zimmerman acquittal in New Orleans, Saturday, July 20, 2013. The Rev. Al Sharpton's National Action Network organized "Justice for Trayvon" rallies nationwide to press for federal civil rights charges against Zimmerman, who was found not guilty in the shooting death of unarmed teenager Trayvon Martin. Photo Credit: Associated Press- Gerald Herbert. 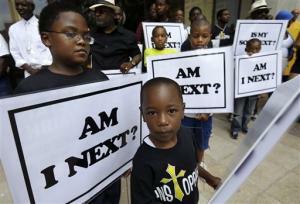 "Justice for Trayvon" protest rallies were held in more than one hundred cities across the United States on Saturday. Many organizers, along with the parents of Trayvon Martin, are vowing to keep marching and keep protesting until changes in the self-defense laws occur and George Zimmerman is held accountable on some level. One week after a jury found George Zimmerman not guilty in the death of unarmed teen Trayvon Martin, people gathered for nationwide rallies to press for changes to self-defense laws and for federal civil rights charges against the former neighborhood watch leader. The Florida case has become a flashpoint in separate but converging national debates over self-defense, guns, and race relations. Zimmerman, who successfully claimed that he was protecting himself when he shot Martin, identifies himself as Hispanic. Martin was black. "It's personal," said Cincinnati resident Chris Donegan, whose 11-year-old son wore a black hoodie to the rally, as Martin did when he died. "Anybody who is black with kids, Trayvon Martin became our son." The Rev. Al Sharpton's National Action Network organized the "Justice for Trayvon" rallies and vigils outside federal buildings in at least 101 cities: from New York and Los Angeles to Wichita, Kan., and Atlanta, where people stood in the rain at the base of the federal courthouse, with traffic blocked on surrounding downtown streets. Chants rang out across the rallies. "Justice! Justice! Justice! … Now! Now! Now!" ''We won't forget." ''No justice! No peace!" Many also sang hymns, prayed and held hands. And plenty of participants carried signs: "Who's next?" "I am Trayvon Martin." ''Enough Is Enough." Most rallies began at noontime. In New York, hundreds of people - including music superstars Jay-Z and Beyonce, as well as Martin's mother, Sybrina Fulton - gathered in the heat. Fulton told the crowd she was determined to fight for societal and legal changes needed to ensure that black youths are no longer viewed with suspicion because of their skin color. "I promise you I'm going to work for your children as well," she said to the rally crowd. At a morning appearance at Sharpton's headquarters in Harlem, she implored people to understand that the tragedy involved more than Martin alone. "Today it was my son. Tomorrow it might be yours," she said. In addition to pushing the Justice Department to investigate civil rights charges against Zimmerman, Sharpton told supporters he wants to see a rollback of stand-your-ground self-defense laws. "We are trying to change laws so that this never, ever happens again," Sharpton said. Stand-your-ground laws are on the books in more than 20 states, and they go beyond many older, traditional self-defense statutes. In general, the laws eliminate a person's duty to retreat in the face of a serious physical threat. Zimmerman relied on a traditional self-defense argument and didn't invoke stand-your-ground, though the judge included a provision about it in instructions allowing jurors to consider it as a legitimate offense. And race wasn't discussed in front of the jury. But the two topics have dominated public discourse about the case, and came up throughout Saturday's rallies. Part of Sharpton's comments echoed those made by President Barack Obama on the case Friday. "Racial profiling is not as bad as segregation, but you don't know the humiliation of being followed in a department store," Sharpton said. In Indianapolis, the Rev. Jeffrey Johnson told about 200 attendees that the nationwide effort is about making life safer for young black men. Johnson said young black men still are endangered by racial profiling, and he compared Zimmerman's acquittal to that of four white officers in the beating of black motorist Rodney King in 1992. "The verdict freed George Zimmerman, but it condemned America more," said Johnson, pastor of the Eastern Star Church in Indianapolis and a member of the board of directors of the National Action Network. In Miami, Tracy Martin spoke about his son. "This could be any one of our children," he said. "Our mission now is to make sure that this doesn't happen to your child." He recalled how he vowed to Trayvon as he lay in his casket that he would seek justice. "I will continue to fight for Trayvon until the day I die," he said. Shantescia Hill held a sign in Miami that read: "Every person deserves a safe walk home." The 31-year-old mother, who is black, said, "I'm here because our children can't even walk on the streets without fearing for their lives." In his remarks Friday, Obama said it's a reality for black men in American to "be followed in a department store" while shopping or to walk down the street and "hear the car doors lock." The nation's first black president said he had both experiences before he rose to social and political prominence. At the New Orleans rally, La'Monte Johnson shared some of the same experiences. The California native said he's been stopped multiple times by police and handcuffed "because I fit the description of someone they were looking for," though he noted charges were never filed against him. "You can be the greatest black guy around, but you can't get away from it," he said. "You're not equal." Attorney General Eric Holder announced this week that his department would investigate whether Zimmerman could be charged under federal civil rights laws. Such a case would require evidence that Zimmerman harbored racial animosity against Martin. Most legal experts say that would be a difficult charge to bring. Zimmerman's lawyers have said their client wasn't driven by race, but by desire to protect his neighborhood. Holder said the shooting demonstrates the need to re-examine stand-your-ground laws. Associated Press writers Verena Dobnik in New York, Christine Armario in Miami, Stacey Plaisance in New Orleans, Amanda Lee Myers in Cincinnati and Charles Wilson in Indianapolis contributed to this report.